Have you ever found yourself in the midst of a crisis of faith? Where something awful happens to you or to someone you care about or even to a total stranger and it causes you to question where God is in the world? Or maybe not a crisis of faith but a moment of doubt, a moment when you thought to yourself “I’m not sure what I think about that whole virgin birth thing,” or “How is it possible that Jesus could be fully God and fully human, can someone really be 100% two different things?” The truth is that all of us, if we’re honest with ourselves, have had moments where we have asked these or other questions because faith itself is a challenge. The trouble is that we are not always honest about this challenge and sometimes even act as though faith isn’t a challenge, giving off an appearance that we have it all together even if we have deep unanswered questions living beneath the surface. This past month I attended the synod assembly for the New England Synod of the ELCA, a gathering attended by pastors, rostered leaders, and other representatives from congregations all over the synod. At this particular gathering, however, we had some guests that weren’t affiliated with any religious group, Lutheran or otherwise, who spoke about their difficulties with organized religion and provided those of us working inside the church with a perspective of churches from outside our walls. The conversation took place on the evening of the first day of the assembly and was very interesting for a variety of reasons. One part that I wanted to highlight was the frustration expressed by several of the guests about how churches seemed to be places that claim to have all the answers and insist that their members agree on the answers. Now I wouldn’t claim this to be the case for all churches, but I can understand where these folks were coming from and have certainly found this to be true in some places. What I heard in that criticism was a desire for a more open minded faith, one that is more comfortable wrestling with the questions of faith and not necessarily coming to clearly defined answers. I heard a desire for churchgoers to be more honest about their struggles to believe so that others who struggle may feel like they are not the only ones. I sat there and thought to myself “we all struggle”, but I also realized that while this might be assumed, its not often talked about. 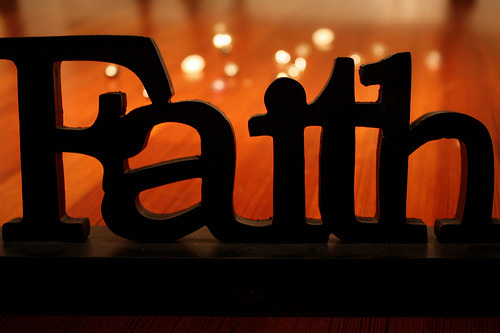 We are quick to talk about the transformative power of faith, but not the difficulty of faith. I raised this thought with the pub theology group on the Tuesday evening following synod assembly and found, unsurprisingly, that each person at the table had struggled with their faith at one time or another. I too admitted that there were days that I had recited the words of the Apostles Creed and found myself getting hung up at times with one statement or another. The truth is that faith is complicated, and we all struggle with it which is why faith is often referred to as a leap, something you do without full knowledge of what it means or how it will result. But while it may be somewhat unsettling at times to struggle with your faith, I would like to encourage you by reminding you that we are a community of faith and thus a community of people who are all wrestling with these thoughts and questions just like you. Furthermore I’d like to remind you of a story from the Gospel of Mark. There is this incident where Jesus encounters a boy who is possessed by a spirit who causes him to convulse and be thrown to the ground and his disciples, try as the might, have been unable to remove the demon from the boy. Jesus invites the boy’s father to bring the boy to him. The father pleads with Jesus that if he can do something, would he please help his son. Jesus says to the man “all things can be done for the one who believes.” The man then responds with one of my favorite prayers in all of Scripture and one that I believe all of us can pray as well, “Lord I believe; help my unbelief.” Jesus goes on to heal the boy and cast the demon out, but for me the most important part of the story is this prayer, prayed by one who is desperate for healing, eager for faith, but who is honest about his doubts. I believe that you and I, and really all people of faith, are like that father, somewhere in between faith and doubt and so I offer to you this simple prayer, the prayer of the honest, the faithful, the ones in need, “Lord I believe; help my unbelief.” Faith itself is difficult and we each know that first hand, but just because you have doubts doesn’t mean you don’t also have faith. In fact, the presence of doubt means that you are engaging your faith and your life in a real and honest way, and that’s a good thing. So may we be more honest about our questions, may we feel free to confess our struggles and our fears, and may we realize that God always hears our prayers.